For the last few weeks, whenever I walked past a certain thicket, I would hear a Geiger-counter of a scolding start up. I would think that any bird scolding me for encroaching on its territory would do it as I approached, not after I was safely past. I would have never known the bird was there if it wasn’t for its loud clicking sound. I would circle back as silently as possible, hoping that the bird would be distracted by the dogs or sheep, so I could spot it. But the bird would fall silent and I never even saw any shadow of movement in the bushes. 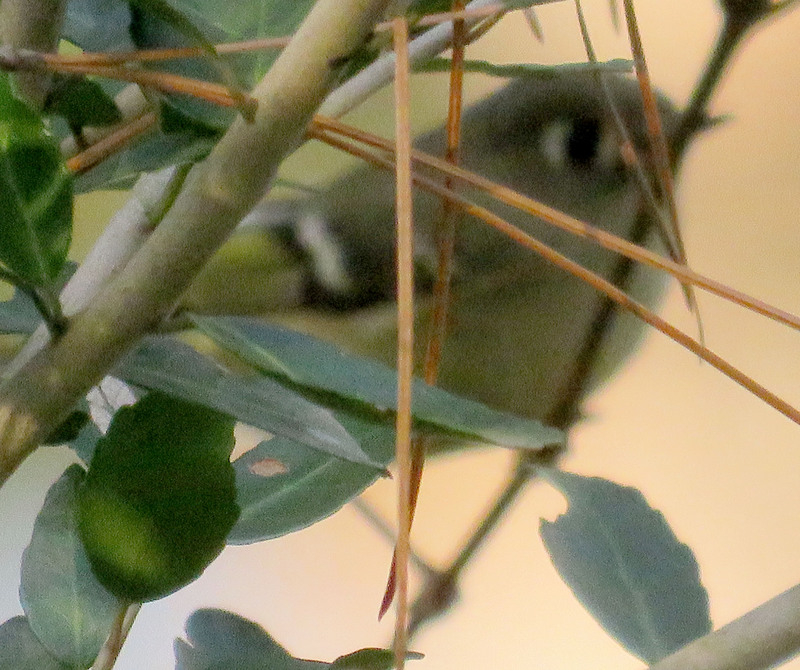 Finally today it hopped out boldly, and I saw it was a Ruby-crowned Kinglet. 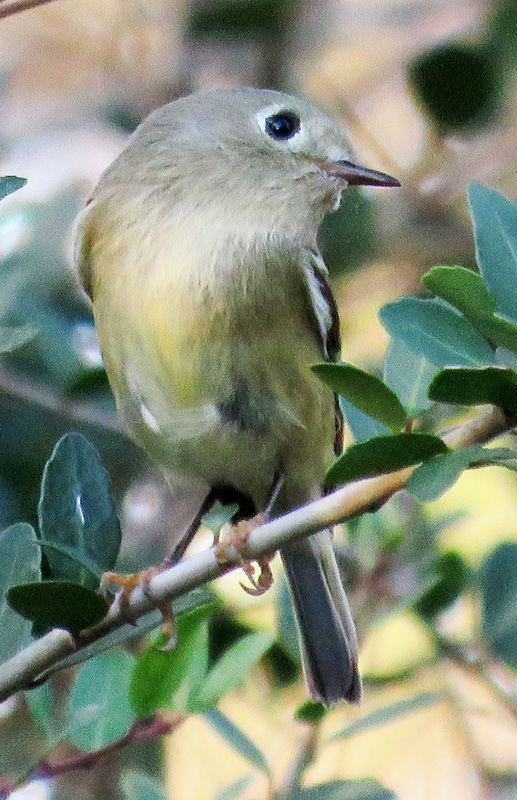 This is one species it took me years to figure out, because I kept looking in the warbler section of the field guides, and instead it is more closely related to gnatcatchers, bluebirds, and robins. But once I learned it, it was easy to remember. The large white sections behind and in front of its eye give it a wild-eyed look, and it has pink feet on black legs –not an ordinary combination! 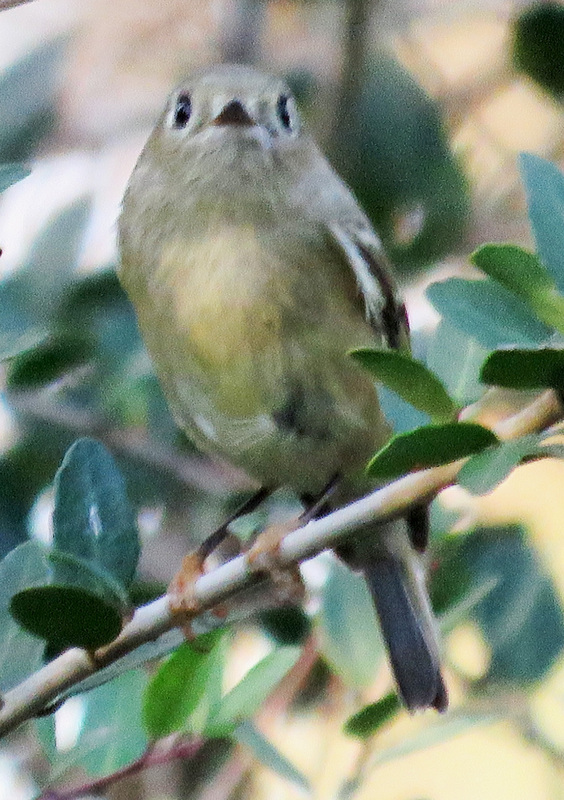 If this picture was the only one I had gotten, I would still be able to ID the bird from the way its eye looks oversized. It made sure I caught every lovely angle. The one I heard today sounded like the one in this recording from the Macauley Library. Click on the little “ML100924” and that will take you to the sound page, where you click on the arrow in the blue box to hear the sounds and watch the spectrogram. Such tiny birds! Lucky you to be able to see and photo one. Good catch. 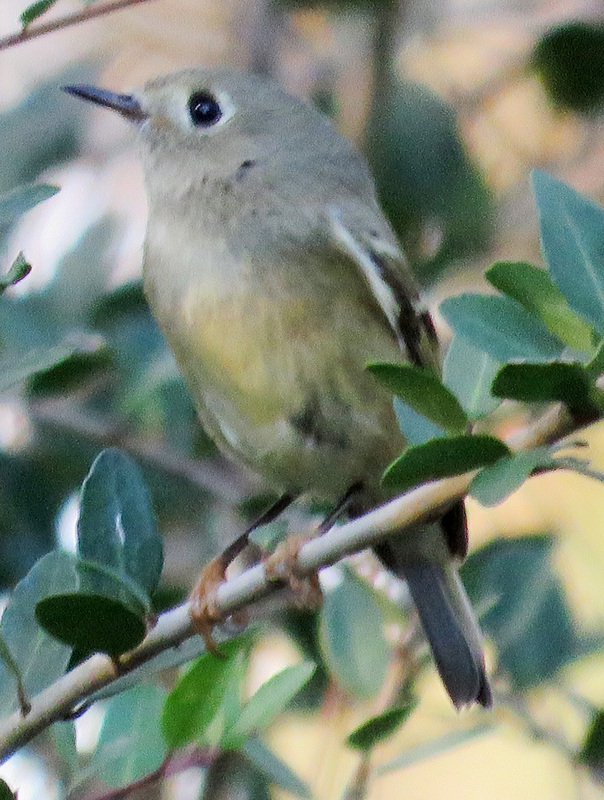 It sound a bit like a wren. I like the ‘irritated’ tone of it. We were out yesterday in the nice weather. Along the trail we came upon 2 separate Brown Snakes each about the size of a new wooden pencil. We exchanged greetings and attempted to see the undersides. They each were resistant. They retracted and readied to strike. Tongues flicked and the bodies tensed. They were such fun to watch. I was so disappointed to not have my camera. It would have made a wonderful video. I have gotten to where I just take my camera everywhere. My daughter had to explain to her three-year-old son what it was, because he has just seen people taking pictures with their phones! and I get that same look when I am out in public. But if I don’t have it, I am sure to see something photo-worthy! I like that “exchanged greetings.” I know the feeling!